Opportunities for micro hydro systems in the Northern Territory are few because the major population centres are not coincident with reliable river or stream flows. Nor are they found near areas that can be dammed to provide a reliable ‘head’ of water without causing major environmental concerns. Even so, micro hydro systems are feasible in various areas across Australia. Answers to some frequently asked questions about micro hydro can be found below. Why use Micro Hydro for electricity generation? The conversion of the kinetic or potential energy present in water to electricity is referred to as hydroelectric generation. Micro-hydro refers to small-scale hydro schemes, designed for single homes or small communities. The main difference between micro-hydro and normal hydro systems is that normal hydro systems are invariably grid connected, whereas micro-hydro is almost always used for stand-alone and RAPS systems. Because of these factors, micro-hydro schemes are generally smaller than 300kW and usually run-of-the-river (un-damned) schemes. The basic premise of a micro hydro scheme is that water flow or pressure is used to turn a turbine, which in turn turns a generator that produces electricity. When considering where micro hydro power plants can be installed, a few issues should be considered. The power contained in water depends on a number of factors. Specifically static head, flow rate and gravity. Static Head is the vertical height in meters between the water source and the turbines blades. For reaction turbines (see below) it is the height from the source to the bottom of the outlet pipe. There is another term known as dynamic head height, and this takes into account frictional and turbulent losses in the supply pipe. This can be calculated correctly by a micro hydro expert but to get a general idea of the dynamic head, multiply the static head by 0.5. The flow rate is the amount of cubic meters per second that will pass through a turbine. In general the maximum amount of water that should be used is 50% of the lowest annual flow rate of the river/creek that is being taxed, in order to preserve the natural environment. Power = (0.5 x static head) x 9.81 x flow rate. This will only give an indication; to get a more precise estimate a micro hydro expert should conduct a detailed analysis. Generally a minimum static head of ten meters is required for any scheme, but it is possible, though very difficult, with heights as low as 2m. Schemes under 100W are not practical, with domestic schemes usually varying from 100-3,000W for DC and 300-5,000W for AC generation. If there is a creek or stream that is either fast flowing or drops vertically 10m or more then a hydroelectric scheme may be a feasible option for the site. Due to the lack of reliable, continuous water flow and good static head in Australia, only around 2% of stand-alone power systems are micro hydro. Building a damn may also be an option but environmental legislation will need to be taken into account. Having some form of shelter will increase the operational life of any generator. Unlike most solar and wind power schemes, a micro hydro scheme will provide power continuously, as long as the water source does not run dry. As these schemes always produce power but power demand isn’t constant, dummy loads must be used. These are essentially loads that serve no purpose; they just absorb the excess power generated by the turbine. Water flow can also be adjusted to control power flow. Micro hydro schemes are low maintenance and when equipped with electronic load controllers can be left unattended. The low cost of this type of scheme is its main advantage. A micro hydro scheme will cost only about 1/10th that of a similar sized PV or wind generation scheme. This cost can be further reduced in some cases with the use of pump as turbine (PAT), see below. These schemes are also long lasting, generating electricity for 50 years or more. Another advantage of this type of scheme is that it can be modified to work as pumped storage. There are some disadvantages though. One of which is that water routing and electric cabling costs are difficult to predict and will depend on the location and size of the scheme and the head and flow rate. Another problem is that water supply can vary significantly with the season, and factors such as drought and flood. There are two basic types of water turbine used in hydroelectric schemes; impulse and reaction. The blades of a water turbine are referred to as its runner. In the impulse scheme, water flow is piped onto the turbine’s runner, which spins freely in the air. The water is then free to escape. 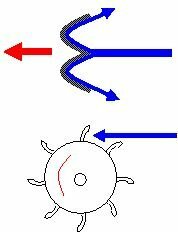 In the reaction scheme however the turbine’s blades are encased in the pipe and so are always underwater. This type of turbine not only harvests the kinetic energy of the water but also energy from the pressure differential, the water above the runner being at a higher pressure than the water below. Depending on the head pressure, certain sub-categories of turbines are best suited for the job. Pump-as-Turbine (PAT) systems simply utilise water pumps. Most centrifugal water pumps can be converted to turbines by changing the direction of water flow. The motors in most electrically driven pumps will function adequately as generators, thus making the conversion simple. Mechanical pumps converted to turbines will output mechanical power. The advantage of this type of system is that the pumps are mass-produced, and there is a lot of dealer support. A PAT system may not be the most efficient outcome but is eminently effective for developing and 3rd world countries. A Pelton turbine has a runner that consists of many bucket shaped blades. One or more nozzles ‘squirt’ jets of water onto the buckets, which provide torque and turn the runner. For micro hydro applications the minimum head required to run a single-nozzle Pelton turbine is around 20m. Adding more nozzles or adding more turbines per shaft can reduce this height. A Turgo turbine is similar in design to a Pelton except that it operates at higher speeds. This means that for the same size runner, the Turgo can output more power. Because the water jet enters the runner on one side and leaves it on the other, the exiting water interfering with the incoming jet does not limit the flow rate of the Turgo as it does for the Pelton. This is illustrated in the image. Because of their higher rotational speed, a Turgo turbine can be connected directly to a generator, whereas a Pelton will require a speed conversion through the use of a gearbox or chain and sprocket or similar. A cross-flow turbine consists of a drum shaped runner comprising two parallel discs with an array of interconnecting blades evenly spaced along their rims. Unlike other turbines, the runner of a cross-flow turbine is always horizontally aligned. A rectangular jet of water is applied to the length of the blades, which convert most of the water’s kinetic energy into rotational torque. 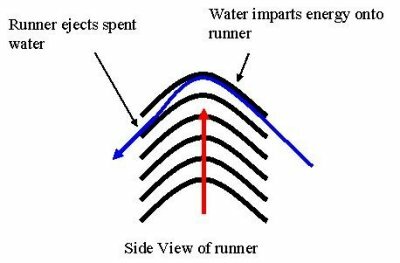 The water then falls, gaining kinetic energy, and imparts this energy to the other side of the runner. Further information on micro-hydro can be found through the Research Institute for Sustainable Energy or this Wikipedia article. Microhydropower.net also contains an active discussion group for people wishing to share their experiences and questions.